Freiberg's Disease results in a focal loss of blood supply to the metatarsal head. 11 and 18 who are experiencing rapid skeletal growth or obese. 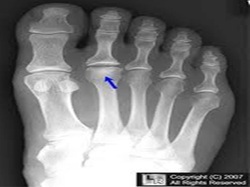 Freiberg's Infraction occurs at the metaphysis of the bone in a region where the primary or nutrient artery of the bone supplies the distal metatarsal. The result is a collapse of the metatarsal head. Pain and swelling localised to the metatarsal head are the most specific symptoms, often accompanied with a limp. Pain may be increased with weight bearing and typically becomes worse with the duration of time spent on the feet. History of trauma may or may not exist. The pain is often vague, related to activity and poorly localised to the forefoot. Patients may describe a chronic history of forefoot pain with periodic exacerbation during sports involving running, jumping or jogging or a sudden onset of pain related to a specific injury.